How can you improve your customer’s experience? When did you last look at your service through a customer’s eyes? Programmes like ‘Undercover Boss’ and ‘Back to the Floor’ show just how valuable an exercise that can be. I wonder how often rail bosses travel on a variety of their services. Recently I found myself on a train journey from London to Aberdeen on the first Saturday of a school holiday. The journey took a little over seven hours and the train was packed with families, many with small children. Most of those travelling were heading to Scotland which meant that their minimum journey time was around four hours; that’s an awfully long time for a small child to sit still! Many continental rail services have a ‘kid’s car’ with a play area and films showing. Why can’t we adopt the same idea in the UK? It is unrealistic to expect young children to sit still and be quiet for hours on end. For parents travelling with young children a journey would be much less stressful and may reduce the amount of luggage they had to bring as most had come with a whole range of activities to try to keep their kids amused. And therein lies another problem. The luggage space was woefully inadequate. The carriages have been designed to cram in as many seats as possible at the expense of storage space. With luggage racks only at one end of the carriage and very few spaces between the seats most passengers had to resort to lifting heavy bags onto the overhead racks at great risk to themselves and the passenger seated below the rack. Even that space wasn’t enough so luggage blocked the aisles. On the continent some of the carriages have luggage racks mid carriage, why can’t we consider that in the UK? And my third moan, the buffet closed for an hour from 12.30 for a crew change. So just at the time we were all thinking about buying some lunch the buffet shut! This feels like a service that is designed for the convenience of the operator rather than to meet the needs of the customer. Earlier in the journey I had tried to buy a bacon sandwich only to be told we don’t do them on Saturdays, so why were they still on the menu? Why is hot food not available on Saturdays when people are travelling long distances without a break? 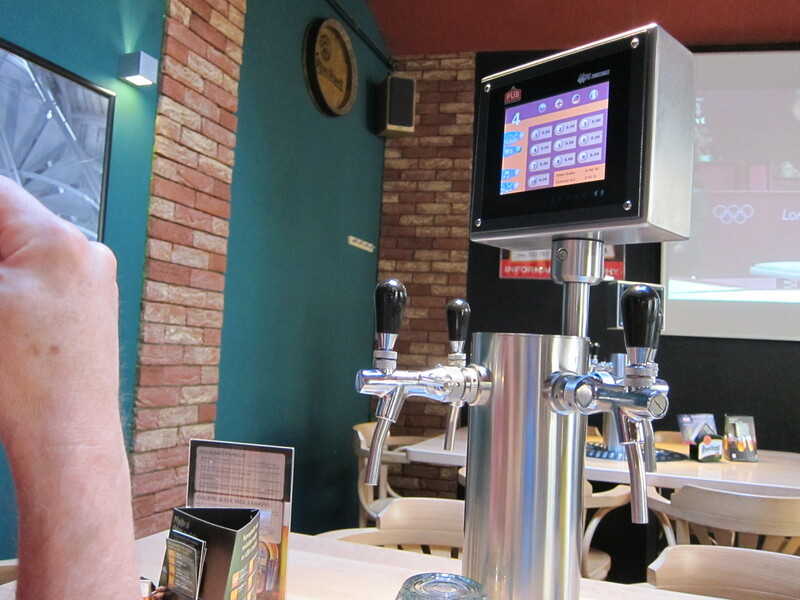 A pub in Prague allows the beer drinker a different experience. Are your trading hours clear and accurate? Are your services available at the time and place of greatest demand? How easy is it for customers to do business with you? Is your point of sale information accurate and easy to understand? If you are running a very small business you may not be able to adopt a disguise like the Undercover Boss but you can take an objective look at your business and if you can’t do it on your own consider engaging a mystery shopper. I’d love to hear how you get on. What do you do well? What changes are you making to improve your customer’s experience? I’m off to conduct my research no doubt there’ll be a blog about that at some point in the future. This entry was posted in Customer service, Small business advice and tagged Business review, customer service by glendashawley. Bookmark the permalink. Wise words Lisa. The simple change that improves the customer experience and the bottom line is the win win we all need.